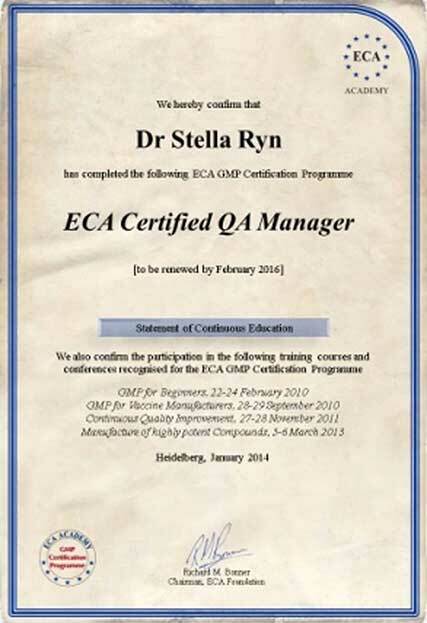 One reason for the ECA Academy’s excellent reputation is its high-quality Certification Programme. In the past years, thousands of GMP and GDP professionals already relied on the programme to advance their knowledge and to get an additional qualification - and completed the ECA Certification Level. This comprehensive qualification curriculum comprises 15 programmes, allowing professionals to combine several seminars according to their fields of interest. Highly qualified personnel is crucial within the field of GMP-compliant manufacturing of APIs and drugs. Although college and university education provide the scientific basis, a continuous advanced training is essential. i.e. usually there is a period of several months between the courses. If two dates are too close together, you can attend one course in the following year. By taking part in an education course, you become ECA member for 2 years, allowing you to join any further course or conference with a 200,- € discount (which prolongs your memberships accordingly) – in addition to other benefits, like free access to the members’ area where you always find the latest update of the "GMP Guideline Manager" online version. The ECA Certification Programmes are not static. They are rather subject to a constant review, and current topics are added just as “outdated” topics are taken off the list. However, if you attended one or more seminars in the past, these seminars will of course be recognised. The ECA Academy enjoys an excellent reputation within Europe's pharmaceutical industry. And the Certification Programme repre-sents a useful completion of your college and university education and reflects your personal development and education in the area GMP and GDP. This is proven by the large number of participants, the often booked-up courses and the fact that many speakers and participants come from European supervisory authorities.The ECA Certification Programme is the largest programme of its kind in Europe. What is essential for the recognition of a qualified training pro-gramme is the speakers' reputation. ECA employs up to 8 speakers for an education course – preferably representatives from industry and authorities. Frequently, experienced consult-ants with an exceptional track record complete the trainings. 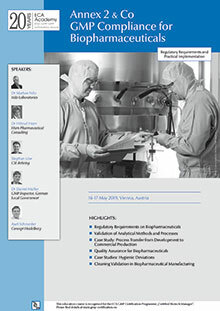 To obtain the certificate, please send an e-mail prior or after the 3rd event to info@concept-heidelberg.de. This e-mail should also list the courses you attended in the past. You will then get your certificate during the 3rd course The Certificate will not only include the title of the Certification Programme, but also lists all ECA courses and conferences you attended. Thus, it will serve as a valid documentation for your continuous GMP and GDP educa-tion. In order to reflect the development of a continuous advanced education for GMP and GDP professionals from 2014 on the ECA Academy will issue the Certificates of the Certification Programme with a validity date. Every new Certificate (see list of the Certificates below) will be valid for two years. To renew it the applicant has to join one ECA Training Course or Conference within that period. Applicants are quite flexible in selecting training courses or conferences for the renewal. 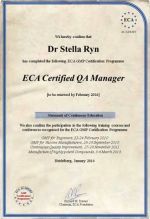 For example, a Validation Training Course or one on OOS Results will also be recognised for the renewal of the ECA Certified QA Manager Certificate, although these courses are not specifically recognized for the QA Manager Certificate (the same applies to all other certificates). This flexibility takes into account that applicants will broaden their knowledge in GMP Compliance. The renewal process is easy and will be managed by the ECA Academy. If you have obtained one of the Certificates below in 2014 or later you will automatically receive a new version of your certificate which contains the new two years Certification statement every time you will participate in an ECA Training Course or Conference. Please contact us at info@gmp-compliance.org if you have any further question. The new Certificates of the Certification Programme will not only include the title of the certification programme but will also list all ECA Training Courses and Conferences you have participated in. Thus, the Certificate will serve as a valid documentation for your continuous GMP and GDP Education. For a larger view of the sample certificate please click on the image. Please also see the brochure on the GMP and GDP Certification Programme.